← Gunma-chan, A Call To Arms! Yes! It’s here! The day has finally arrived for the new Winter Pepsi flavor! We’ve been waiting for this one for a while–how could you not be excited for Strawberry Milk flavored cola? Now, Strawberry Milk may seem like a bizarre soda flavor, especially for Winter. Strawberries are usually considered a summer fruit in the US, but here in Japan they’re actually often associated with winter and early spring. Usually grown in greenhouses, strawberries are one of the most important ingredients in the ubiquitous Christmas cake, a strange and spongy descendant of strawberry shortcake that everyone seems convinced is the traditional Western holiday dessert. My coworkers were shocked when I told them that it wasn’t a part of our Christmas rituals! Strawberry Au Lait (or Strawberry Olé as it is sometimes hilariously romanized) is also fairly popular here, so a soda version isn’t that far of a stretch. Well, ok, Strawberry Milk soda might be a little odd–there aren’t a lot of strawberry sodas out there to begin with, and milk sounds like a pretty wacky flavor for your fizzy drink. Cream sodas are common enough though, and the milkiness falls squarely in that category. The bottle is super cute, much like a toddler wearing a giant strawberry costume. Polka dots! A leafy green Kermit the Frog collar! Add a slightly metallic hue and you’ve got nothing less than adorable. But how does it taste? In a word, fabulous. 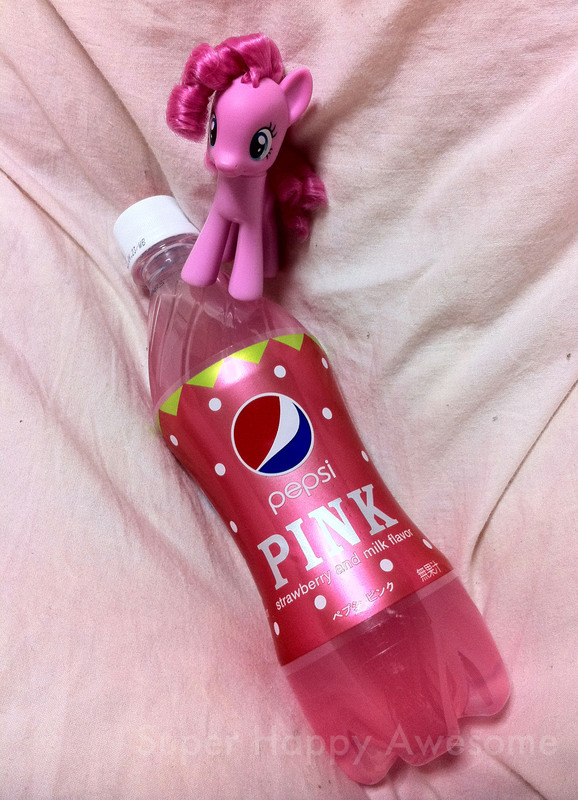 Pinkie Pie approves of this soda! Now, I’ll be honest–it’s candy sweet, and bears little resemblance to the fruit it was named after. If you hate artificial strawberry flavoring, you will hate this soda. But for me, it’s nicely balanced with the creaminess and the artificial flavoring isn’t overpowering. Sean was content with a single sip of mine (he might have mentioned that even the scent was too strong for him…) but I will definitely be buying more of this crazy concoction. There aren’t enough strawberry sodas on the market (are there any?) and I for one, wish this could become part of the regular Pepsi line up. But as is always the way, in a few short weeks it will be relegated to the bargain bins, and then it will disappear forever, leaving nothing but memories of its creamy, fruity goodness. So get it while it lasts! This entry was posted in Food! and tagged ピンク, ペプシ, ペプシピンク, candy, cola, drink, My Little Pony, Pepsi, pink, Pinkie Pie, seasonal, soda, strawberry, strawberry au lait, strawberry milk, sweet. Bookmark the permalink. 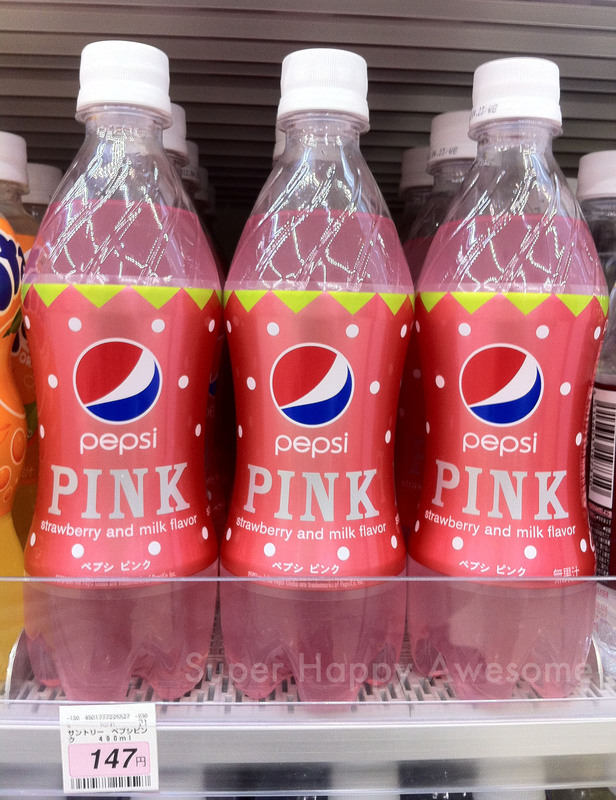 12 Responses to Pepsi PINK! It’s SO girly, haha! Sean definitely didn’t care for it, but I loved it. If you don’t like soda though, it probably won’t be for you–mmmm, carbonated sugar water! Would they ever sell that in the U.S or is it just a Japan thing? Far too fizzy for me. Too many bubbles. Sounds interesting- I’ll keep an eye out for it at my local Lotte, though I doubt I’ll be seeing it here in the U.S. ;we do get the seasonal Pocky flavors, though- i had some Pumpkin back in autumn. While I usually prefer the bite of a Coke, Pepsi’s not bad, and I’m definitely curious about this flavor. I looked on the Internet and it seems there are various strawberry sodas out there, including Fanta, Welch’s, some “retro” stuff like Nesbitt’s . . .and Hello Kitty Ramune. Where can I buy all of these Pepsi flavors??? Is there a link online somewhere that I can purchase from? I have never seen any of these in any store. Is there a store that I can go to buy them?